Sierra Metals Inc. is a Canadian based growing polymetallic mining company with production from its Yauricocha Mine in Peru, and its Bolivar and Cusi Mines in Mexico. The Company is focused on increasing production volume and growing mineral resources. 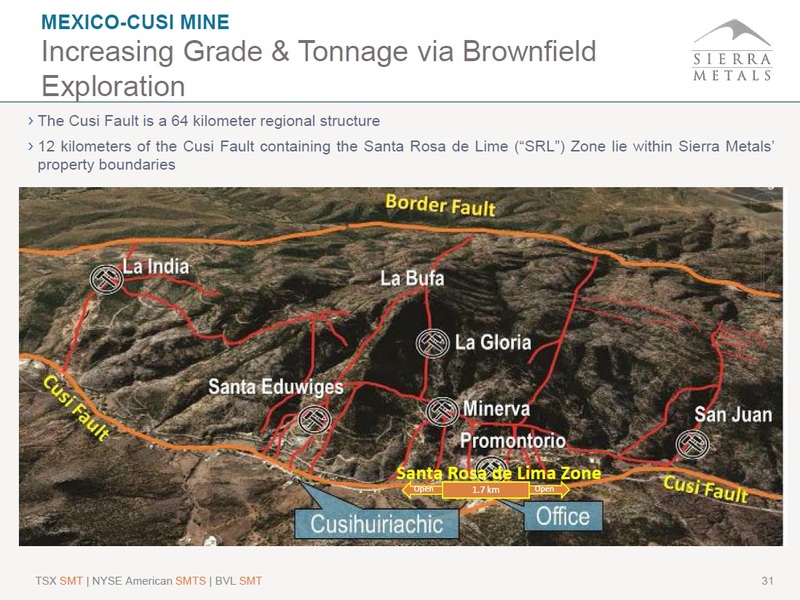 Sierra Metals has recently had several new discoveries and still has additional brownfield exploration opportunities at all three mines in Peru and Mexico that are within or close proximity to the existing mines. Additionally, the Company has large land packages at all three mines with several prospective regional targets providing longer term exploration upside and mineral resource growth potential. Acquired in 2011, Yauricocha is an underground polymetallic mine using the sublevel block caving and cut-and-fill mining methods. It has been in continuous operation since 1948. The Yauricocha property covers 18,000 hectares that straddle a 20 km strike length of the prolific Yauricocha fault. The mined ore is processed at the Chumpe processing plant. The daily mining rate is approximately 3,000 tonnes and the Chumpe plant has a daily capacity of 3,000 tonnes. Five different types of ore concentrates are produced, transported to Lima and then sold. 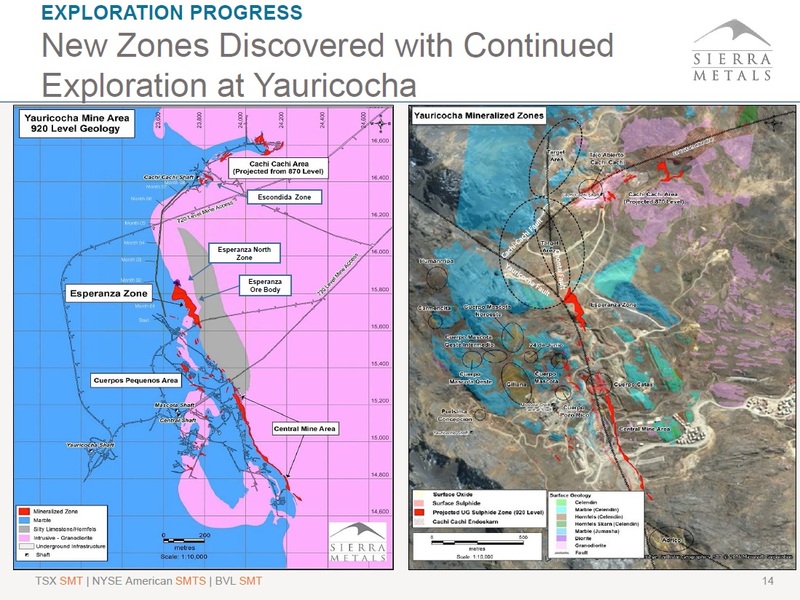 Based on current proven and probable mineral reserves and current throughput rates, Yauricocha has an expected mine life of approximately 8.7 years. However, extensive deep drilling was completed in 2016 and 2017 to expand the mine life. On November 13, 2017, the Company released an updated NI 43-101 compliant reserve and resource estimate for the Yauricocha Mine. * Measured and Indicated Resources include Proven and Probable Reserves. Current brownfield exploration and drilling focused on the Central Mine Area which is only a small portion of the total land package. La Fortuna has significant outcrops of copper. Further drilling may determine if there is potential for higher grade copper source. Kilkasca was a former producing mine. This may represent a promising target for future organic growth and expansion. Sierra Metals Inc. is a significant mineral property holder in Mexico with a land package of over 142,000 hectares. The Company's key assets in Mexico include the 100% owned producing Bolivar and Cusi mines located in southwest and central Chihuahua State, respectively. On April 19, 2017, the Company released an updated NI 43-101 compliant reserve and resource estimate for the Bolivar Mine. Titan 24 Geophysical Survey completed on Bolivar West and Northwest areas resulting in 24 anomalies and 8 high value drill targets. 17,000 Meters of drilling program completed in 2017 with the majority occurring at Bolivar West where high grade copper intercepts have occurred. 28 holes (12,300 meters), recently completed which provided the Company with higher Copper, Zinc and Silver grades. This detailed drill data will be used to update the current mineral resources report at the Bolivar mine. Bolivar West average grade of 2.55% copper equivalent with an average true width of 9.1 meters, which is significantly above El Gallo’s current resource grade and current head grades. Average grade of the intercepts for 29,500 meter program is 372 g/t AgEq with Average true width of 3.8 meters. Step out drilling extends silver mineralization beyond the Santa Rosa de Lima zone with similar high-grade characteristics. Zone extended from 1 km to 1.7 km all within the 12 km structure running inside Sierra Metals property boundary. Mr. Gonzales has more than 35 years of experience in the mining industry, most recently he was COO at Buenaventura and prior to that was with Barrick Gold from 1998 to 2013 where he most recently held the position of Executive VP and COO. Prior to joining Barrick, he served in various roles with Southern Peru Copper. Over 34 years of experience in mine production management, project development, engineering, exploration and mine consulting in precious, base metals and aggregate operations in the Americas. Most recently COO at Jaguar Mining. 25 years experience in the mining industry, most recently in a consulting role and several Board directorships. He was Executive Vice-President, Finance and Chief Financial Officer of Aur Resources. 26 years international experience in mineral exploration with a positive track record for increasing companies' resources, output and company value. Mr. Lujan most recently spent 6 years with Mata-Trafigura as the General Manger. Over 30 years of international experience in mining operations, mine and business planning, engineering studies, project management and optimizing development. Mr. Zuzunaga was most recently at BISA as a Technical Studies Manager. Over 35 years of experience in management, strategic planning, organizational effectiveness and security and risk management in different countries in Latin America. Most recently he was the Operational Excellence Manager for Buenaventura. 34 years metallurgical and mine management experience with a positive track record for increasing companies' output and company value. Mr. Chung was most recently with Rio Alto Mining as the Vice President of Projects. Mr. Arias has over 21 years of experience in the field of international mining finance. He is the founder and President of Arias Resource Capital Management LP. On August 1, 2018, Sierra Metals Inc. announced that it will release its 2018 second quarter consolidated financial results on Monday, Aug. 13, 2018, after the market closes. Senior management will also host a webcast and conference call on Tuesday, Aug. 14, 2018, at 10:30 a.m. ET. On June 18, 2018, Sierra Metals Inc. has released the results of a preliminary economic assessment (PEA) regarding the Company's Cusi mine, located in Chihuahua state, Mexico. Life-of-mine silver production: 30 million ounces. On June 7, 2018, Sierra Metals Inc. reported positive drilling results from high-grade polymetallic structures including five meters of 36% zinc, 9% lead, 175 g/t silver located 250 meters east of current mine operations at the Yauricocha mine, Peru. On June 6, 2018, Sierra Metals Inc. has released results of an infill drilling program evaluating the continuity and characteristics of geophysical anomalies that were previously tested as part of a recent Titan 24 geophysical survey and deemed high-value targets at the Bolivar property, Chihuahua, Mexico. 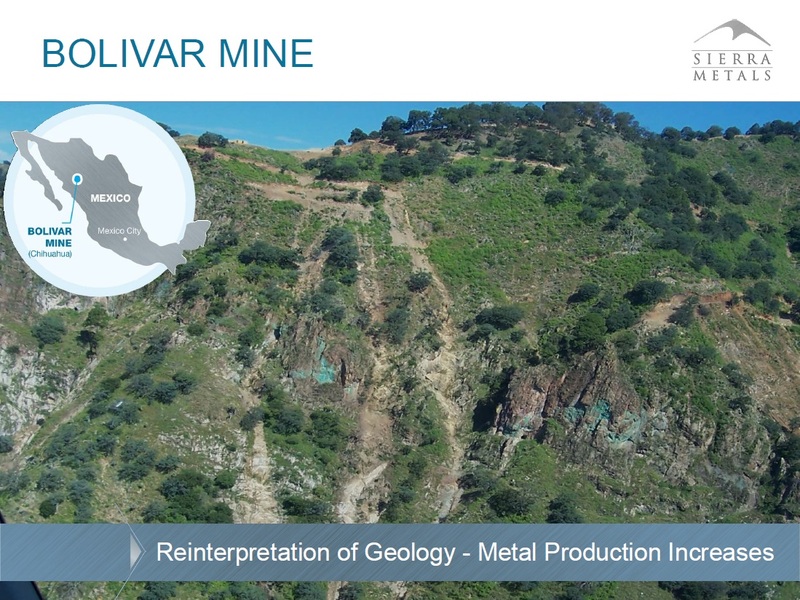 Sierra Metals confirmed northern extension of the Bolivar northwest orebody containing an average grade of 1.37% copper and an average true width of 8.1 meters at the Bolivar mine, Mexico. On June 4, 2018, Sierra Metals Inc. has released the voting results from the Company's annual general meeting of shareholders held on May 30, 2018. Shareholders voted in favour of all matters brought before the meeting, including the reappointment of PricewaterhouseCoopers as auditor for the ensuing year and the election of management's nominees as directors. Sierra Metals shareholders elect seven directors at AGM. On June 4, 2018, Sierra Metals Inc. has released drilling results demonstrating high-grade polymetallic ore and a new mineralization style of hydrothermal breccias located at the Contacto Oriental zone extension situated within the central mine at Yauricocha. 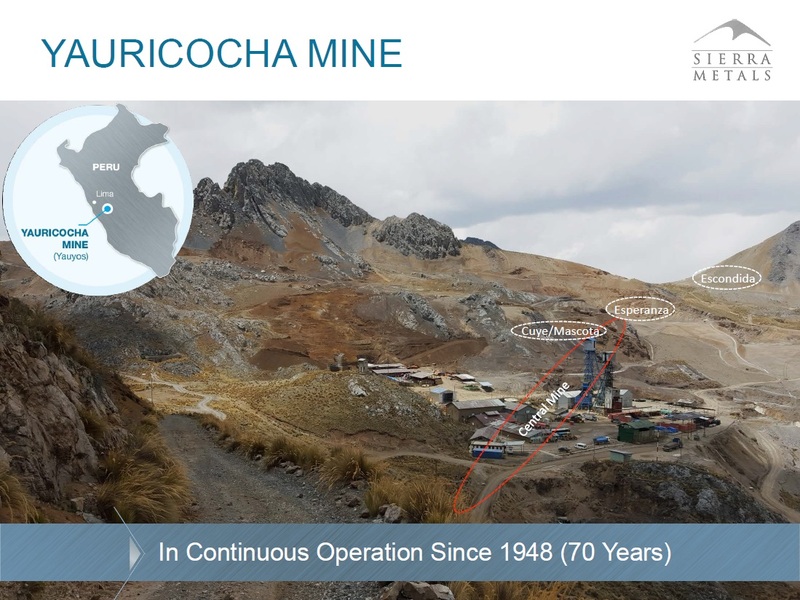 Sierra Metals discovers new high-grade zone including 1.86 g/t Ag, 0.54% Pb, 0.28% Cu, 9.53% Zn over 57 meters located 220 meters east of the current mine operations at the Yauricocha mine, Peru. 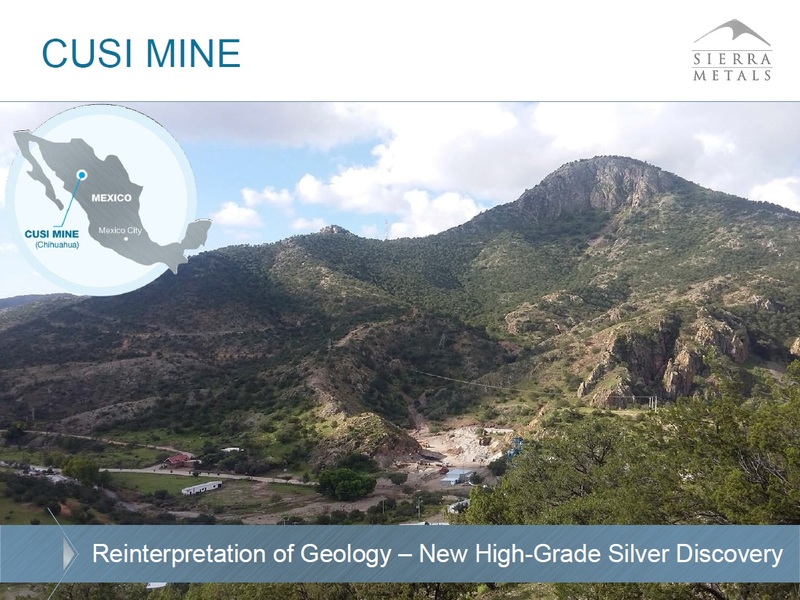 On May 22, 2018, Sierra Metals Inc. has updated its mineral reserve and resource estimate at the company's Bolivar mine, located in Chihuahua state, Mexico. A technical report prepared by SRK Consulting (U.S.) Inc. in accordance with National Instrument 43-101 standards of disclosure has been completed and will be filed on SEDAR within 45 days of this news release. 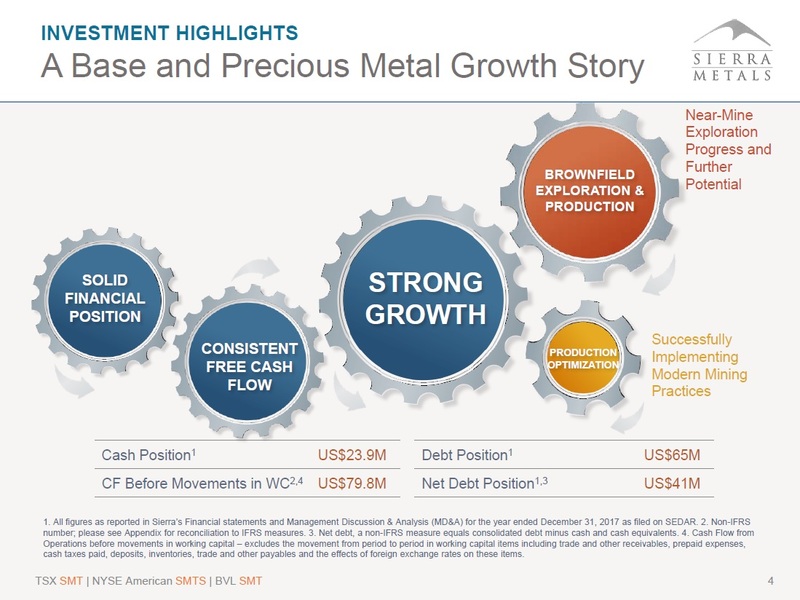 On May 09, 2018, Sierra Metals Inc. had revenue of $61.7-million and adjusted EBITDA (earnings before interest, taxes, depreciation and amortization) of $27.4-million on throughput of 557,710 tonnes, and metal production of 4.4 million silver equivalent (AgEq) ounces, 23.4 million copper equivalent (CuEq) pounds and 47.2 million zinc equivalent (ZnEq) pounds, for the three-month period ended March 31, 2018. The Company achieved record quarterly throughput from both the Yauricocha and Bolivar Mines, continuing the successful production increases realized during 2017. Consolidated production of copper increased 11%, silver decreased 15%, lead decreased 31%, zinc was flat, and gold increased 10% compared to Q1 2017. On April 11, 2018, Sierra Metals Inc. has released first quarter 2018 production results featuring the highest level of consolidated quarterly throughput to date. 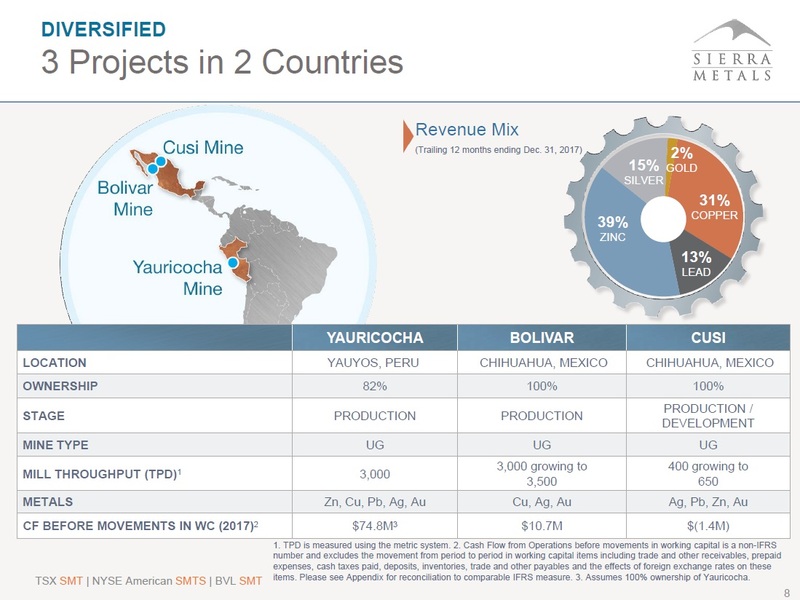 Results are from Sierra Metals' three underground mines in Latin America: the Yauricocha polymetallic mine in Peru, and the Bolivar copper and Cusi silver mines in Mexico. Record quarterly throughput at both the Yauricocha mine and Bolivar mine.